Having purchased the building, the new owners initially intended a renovation for the sole purpose of meeting present comfort requirements and realising some energy efficient measures. Eventually they decided to raise the bar in order to reach the passive standard. This renovation will be accomplished in several stages. The roof and rear facade were insulated during the renovation. 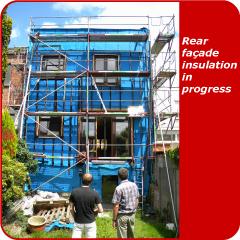 In a later stage the ground floor and the front facade will be insulated. In the building a ventilation system D with a heat recovery unit was installed. Before entering the ventilation system the incoming air will pass through an underground heat exchanger which assures preheating. Preheating the air is realized by the ventilation system. The wall heating provides the additional heating in the rooms. In the bathroom a complementary electrical heater was installed, the use of which has not been necessary up to now according to the occupants. In a later stage solar collectors are to be installed for sanitary hot water production. Photovoltaic cells were mounted on the flat roof and supply the buildings total electricity need. Having put into practice the stage 2 interventions, the owners already show great satisfaction. The wall heating delivers radiant heat during the winter period, thus providing a very high level of thermal comfort. For the wooden rear facade the owners choose to use FSC-labelled wood. The plastering was carried out in loam. The installation of a green roof was taken into consideration, but stability calculations pointed out that the existing roof construction does not support such an option.